What if a complex film like Aaranya Kaandam narrated in the most accessible manner, especially for our Tamil audiences, who prefer entertainment over artistic beauty? The end result would have been fruitful at the box office. Though a film’s quality can’t be judged with how much money it made for producers, satisfying your target audiences should be the main motto for filmmakers but to be honest, 90% of newcomers doesn’t mind much about the investors. 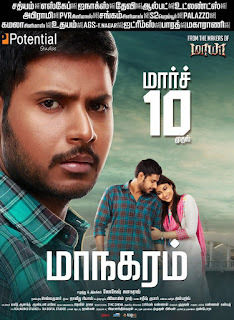 Fortunately, director Lokesh Kanagaraj belongs to the remaining 90%, he exactly knows where to showcase his exemplary filmmaking skills and also smartly incorporated necessary elements for the mainstream audiences in Maanagaram. 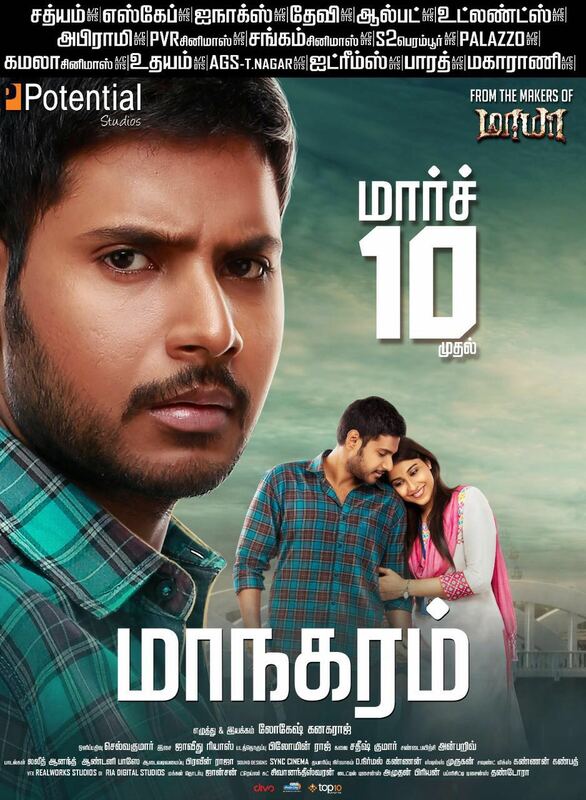 Maanagaram as the title suggests, the film deals with the perspectives of people on the fast moving urban life. A youngster (Shri) with a lot of dreams comes Chennai for an interview, then there is a care-free city dude (Sundeep Kishan), who goes to any extreme for the safety of his crush (Regina Cassandra). We also have a soft-spoken taxi driver starts his first-day job in the city and a dismayed underworld don(Madhusudhan), whose son gets wrongly abducted by three small time gangsters. How the lives of these four people hyperlinked and lead to the rest of the proceedings have been flawlessly written and executed by Lokesh Kanagaraj. As said earlier hyperlink cinema is a complex theme, narrating it in the most entertaining fashion needs a lot of work and research. Any good cinema would have realism and fantasy in equal proportions, for example, you may or may not agree with the fact that all these four stories and characters get connected in a single day but at the same time, they are very real and the situations unwind in front of us are relatable. Yes, you get to see a lot of rouge cops (don’t restrict your vision to the last day scenes of Jallikattu protest ) but we also witness quite a few kind-hearted policemen in our daily life— the way Lokesh introduced such realistic characters is the biggest strength of Maanagaram, it's the movie's heart-line. Discussing the brilliance of Lokesh’s writing, he connected each and every dots in the screenplay— The first scene opens with the interview session between Regina and Shri, the latter gets a call (we don’t know who) and the former gets a call (screen blinks Divya, who is that? We don’t have answer). In the climax, Shri speaks to his dad and Regina tells us much before that she is a close friend of Shri’s girlfriend Divya. Thus we get to know why Regina feels getting a job for Shri is very important! This is just one example of Lokesh's detailed, there are plenty of things to discuss and decode. Among all the characters sketched by Lokesh, Munishkanth is a master stroke. After Mundasupatti, the actor makes us laugh throughout the film, his unfeigned innocence is a major attraction and it has been well utilized in the climax, where he moves away from the money bag! All the actors have given their best. Sundeep Kishan’s swag mannerisms fit the bill for the bold and daring character while Shri’s subtle expressions rightly complement his righteous role and Regina has also carried her role with great ease. Special mention to the young technical crew of Maanagaram, music composer Javed Riaz used background score whenever necessary and rightly understood the importance of silence. Cinematographer Selvakumar showcased the nightlife of Chennai in a different color and Philomin’s cuts have contributed for the crystal clear narration. Our final word is Maanagaram can be watched without any second thought, book your tickets and enjoy this quality thriller with your family!